There I stand every week, like a lost child, rocking from left foot to right foot, peering down at the Gouda, the Camembert, the Manchego. I pick them up; I put them down. I obstruct other shoppers' access. I'm drawn to the fancier, top-dollar cheeses—the kind that need no elaboration, no salad or sandwich or frittata to carry them to the table—but I give myself a swift wrist-slap and redirect my hand to the more wallet-friendly, crowd-appropriate options. My shoulders slump—I just can't get that excited about serving (or snacking on) a log of goat cheese or a block of feta or even a ball of mid-range mozzarella. Into a recipe, they must go. But no sulking yet: There's a strategy for turning a plain Jane cheese into a stand-alone stand-out. With a glug of olive oil and the aromatics in the pantry, an otherwise standard cheese morphs into the centerpiece of an appetizer plate. It's all in the marinade. You want something sturdy enough to withstand a potentially-warm oil bath and mild enough to benefit from—rather than be overshadowed by—even more flavor. A log of firm goat cheese? Marinate it. A wedge of soft-ripened goat cheese veined with truffle? Serve that straight-up. 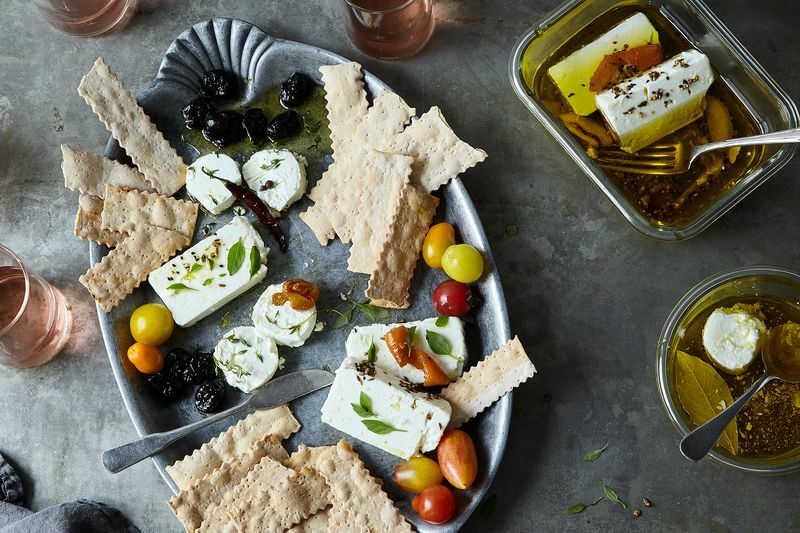 Avoid marinating any cheese that doesn't sound delicious bathed olive oil: A hard cheese like Gruyère or cheddar, or something sumptuous and squishy like Brie or Neufchâtel, or a funky blue—all are no-go's. Stick to the porous cheeses that can handle a bit of gentle heat. Some popular choices are goat cheese, feta, and mozzarella. 2. Pick your aromatics, then release their fragrance in oil. Rummage through your spice drawer and find the flavors you're craving: mustard, coriander, and cumin seeds; chile flakes; peppercorns; bay leaves; star anise; smokey black cardamom pods. Gather sturdy fresh herbs, like rosemary and thyme, along with citrus peel, smashed garlic cloves, and/or thinly sliced shallots. Place everything in a small pot and pour olive oil over top. You'll need enough to cover a block of cheese, say 1/3 to 1/2 cup. Warm the pot over very low heat for 15 to 20 minutes, until the spices and aromatics are making your kitchen smell like you've cooked an elaborate feast (you'll also see that the citrus peels will shrivel as they dehydrate). 3. 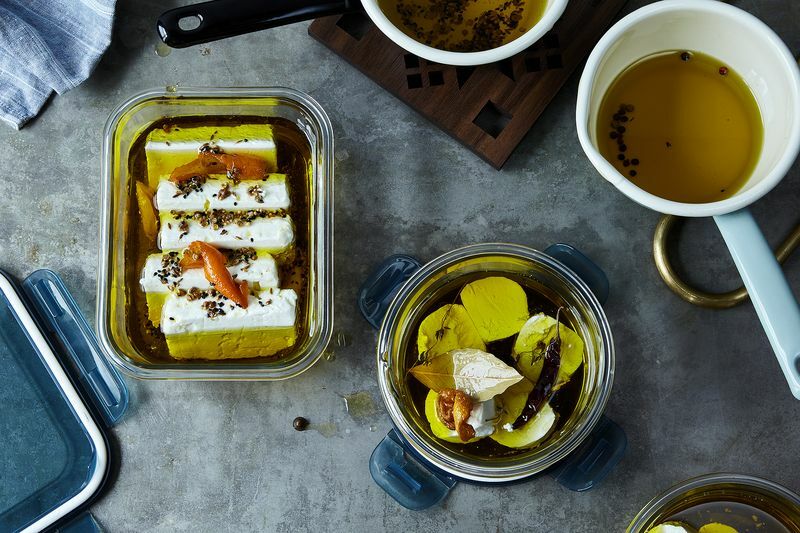 Introduce your cheese to the infused oil. Place the cheese—slice it into rounds or wedges so that you increase the surface area that will soak in the oil's flavor—and place them heat-proof containers (preferably the kind that you can store in the fridge later, for your leftovers). You can also use a tall jar and stack the cheese blocks vertically. You can add more delicate herbs—like basil, parsley, fresh oregano, marjoram—now. 4. Marinate and wait (or not!). You can serve the cheese right away or let it hang out for 20 minutes, or 2 hours, or 12 hours (transfer it to the fridge if you're waiting a significant amount of time). The cheese will absorb more flavor over time. You can even skip the heating process and pour room temperature oil over your cheese, adding the aromatics of your choice. But since you're not using heat to release their flavors, you'll want to wait 12 hours or more before you dig in. If you've been storing the cheese in the refrigerator, let it come to room temperature before serving so that the flavors will be more pronounced. Present it on a platter with vegetables, olives, crackers, bread, pita, and any of your other favorite snacks, or use it as you would its less flavorful ancestor: Smear on a sandwich, bake with pasta, or crumble into a salad or over broiled fish. Keep any leftovers in the oil in the refrigerator for up to five days. And don't toss the extra oil—there's rich flavor in there. Toss it with pasta, use it to marinate vegetables, or whisk it into a salad dressing. Look at all your cheese has given you! It's almost like all that time you've spent in front of the cheese aisle amounted to something, after all.